Can I trust the product labels completely? The food regulations in Finland stipulate that any product contains the ingredients listed on its label. We manufacture our products in compliance with international GMP and ISO quality standards. These standards ensure the high quality and safety of the products. Can all of the products from the Wild Food range be used simultaneously? Yes, they can. The product range has been designed to support nutritional intake. Should I take breaks in using these products? It is important to understand that we need powerful nutrients every day to ensure the well-being of our body. Can these products be given to children? Do Arctic Nutrition products contain additives? We use the best possible additives in our products. We process our products with different methods that maintain their nutrients, without heating. This is why we use certain additives, to ensure the shelf-life of the products, for example. Furthermore, some products require additives to maintain their composition. You can find a list of additives on the product labels. Who actually makes these products, if Arctic Nutrition only commissions them? Depending on the profile of ingredients, products are manufactured in collaboration with business partners who are best-suited for processing and manufacturing these products. Can these products be given to pets? Arctic Sun and Vital are not suitable for dogs, for example, because these products contain xylitol. Other products can be given to pets. However, we recommend contacting a vet to specify the correct dosage. What ingredients do the products contain? Where are the products and the ingredients processed? Could I receive instructions for use if I have some kind of illness? Our nutritional supplements are foodstuff, and we can only make health claims about them that have been approved by Finnish law. We are compliant with Finnish legislation. That is why we cannot share instructions regarding our products that would be different from the product label. Where are the production facilities of the products located? In general, we do not publicise the contact information of our production facilities or business partners (at their request). Previously, we have been open about the details of our business partners, but due to disruptive contact attempts, we have restricted handing out this information. Is it possible to overdose on your products? The dosage instructions of our products are safe and compliant with food safety regulations. Adhering to these instructions ensures that the products can be used safely. Are there any differences between natural and synthetic ingredients? You can watch a video about this here: watch the "Scientific perspective" video. Where are Elixir berries gathered and by whom? The berries are gathered in Finland, via a network of Arctic Nutrition’s business partners and their subcontractors. 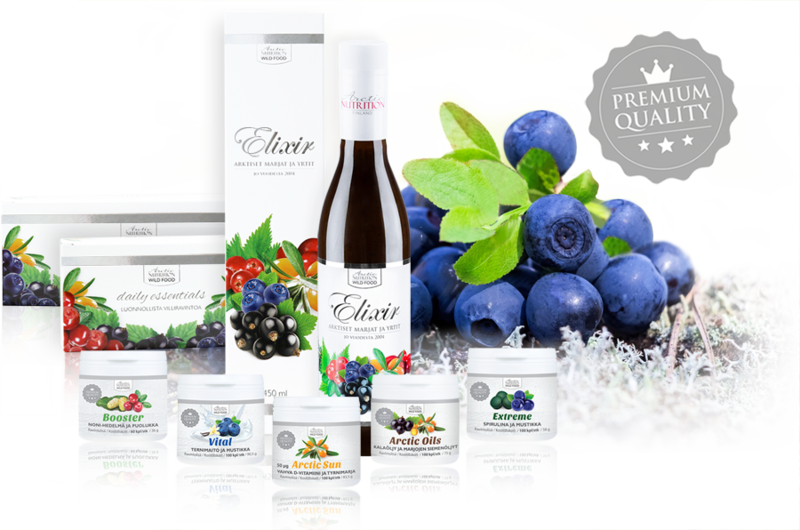 Elixir’s manufacturing method is exceptional: berries are processed during production while frozen, they are used entirely (including their seed oils), and their shelf life is ensured without heat treatment. This makes it possible to maintain the strength of berries and herbs in a fresh and natural way. If Elixir were to be pasteurised, a lot of important nutrients would be destroyed. How many different vitamins are there in the product? Why does the product contain sea buckthorn? Fat-soluble Vitamin D requires good fats to be digested well. Fatty sea buckthorn berries are a great match with Vitamin D 3. 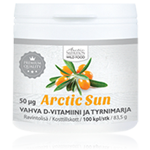 The recommended safe intake of Arctic Sun has been specified on the product label. 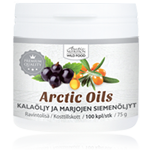 Berry seed oils and herbs from Finland. Fish oil from the clean regions of the Northern Atlantic. Can Arctic Oils be used by someone who is allergic to fish? In most cases, yes, because there is no fish protein in the product. However, anyone with a fish allergy is advised to test the suitability of the product before use. How many different fatty acids are there in the product? Where are Extreme’s ingredients from? Extreme contains blueberries from Northern Finland, and Spirulina Pacifica, freshwater seaweed grown in Hawai’i. What difference is there between spirulina products? Pacifica is a species of spirulina which was selected as the best alternative food source of the world at the UN World Food Conference in 1974. 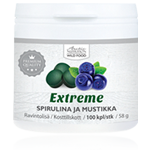 This Spirulina is used in Extreme. To ensure the high quality of the product, only the best part of the crop is used. The poorer part of the crop is used for food and weaker nutritional supplements, as well as for animal fodder. Due to plenty of sunshine and clean air, Hawai’i is the idea place for growing high-quality Spirulina. Therefore, we can say that the Spirulina Pacifica used in Extreme is the best-quality spirulina available in the world. Furthermore, the freeze-dry technology we used to manufacture our products maintains their level of nutrients. Is there Vitamin A in Extreme? The Spirulina Pacifica in Extreme contains a precursor of Vitamin A (beta-Carotene), from which our bodies can synthesise the required amount of Vitamin A. Extreme contains more than 100 different nutrients, vitamins and minerals. Where are Booster’s ingredients from? 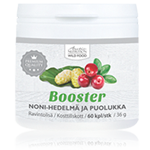 The lingonberries used in Booster are gathered in Finland and Noni fruit in Hawai’i. Noni fruit is freeze-dried and powdered, and then brought to Finland. What is Booster’s casing made from? The casing is vegetable-based, extracted from carrots. If you wish, you can open the casing and mix the powder with some liquid. Vital’s colostrum comes from Germany. It is milked from cows in the Alpine region of Bavaria. The colostrum from the first four milking times after a calf is born is added to the product: the best-quality colostrum available. 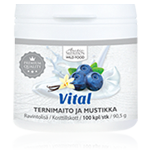 Vital also contains blueberries from Finnish Lapland: the most nutritious blueberries in the world. Will there be any colostrum left for the calf? Cows produce a lot of colostrum from the first milking times onward. A calf cannot drink this entire quantity alone, there is plenty of excess colostrum. This excess is used to manufacture Vital colostrum. It would be a waste to throw precious colostrum out. Is the product suitable for those with lactose intolerance? Yes. The lactose has been hydrolysed in the product.